Drain Care Part 2: Protect Your Kitchen Sink This Holiday Season | Reliance Plumbing Sewer & Drainage, Inc. 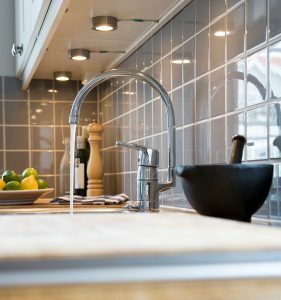 Failing to keep the care of your kitchen sink a priority can not only lead to serious drain clogs and piping problems, but if you have a garbage disposal then you could find yourself dealing with damage to that unit. Where your garbage disposal is concerned, there’s a fairly common misconception that the blades of the system are sharp, and therefore can chop anything up that you put down your kitchen sink drain. This is just not true, though. Your garbage disposal system does have “blades,” if that’s what you want to call them. They are actually grinder plates—impellers—that depend on centrifugal forces in order to grind down food waste. Then, the waste is flushed down the drain. At this point, you should keep the faucet running along with the disposal system, since the flow of water helps the waste move all the way down the drain. But, there are items that can overload your garbage disposal. We’ll talk about those, and then some items that won’t harm a garbage disposal, but will negatively impact your kitchen sink drain. Hard Items: Hard food items like bones and fruit pits are a threat to your garbage disposal system. We can’t say we’d even trust those are marketed as being able to handle fruit pits. In almost all cases you’re just better off disposing of them in the trash. Fibrous Food Waste: We’re talking about things like celery stalks and corn husks. They can get wrapped up in the moving parts of your garbage disposal system, and the system can, therefore, be damaged as it struggles to continue with its regular operation. Pasta and Rice: Sure, these won’t do anything to the garbage disposal, but they’re not great for the drain. This is because they expand when they get wet. As they absorb water within your pipes and expand, they can easily cause blockages in the drains. FOG: Fats, oils, and grease are referred to as FOG. Like pasta and rice, this doesn’t pose any sort of threat to your garbage disposal system, but rather your sink drain, and sewer line. Individuals pour these hot liquids down their kitchen sink after cooking thinking they’ll just pass on through, but they actually harden and congeal pretty quickly on the way down due to the water in your pipes. It’s only a matter of time before it builds up enough to create serious and messy clogs in your plumbing system.